Maktub is an interesting change of pace per se. I was telling my editor that I had seen a trailer for this wacky film I thought was made in India – until I was corrected by him. I was definitely not in my right state of mind to get the countries mixed up until I re-watched the trailer again. It still looked crazy cool and I noticed it was from Israel. It’s a Netflix Original, so to the queue it went! 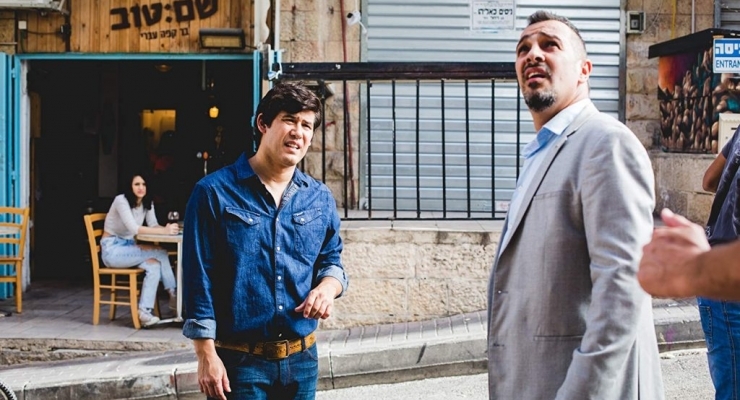 Chuma (Guy Amir) and Steve (Hanan Savyon) are collectors and enforcers for the local mob boss in Jerusalem. They spend their days waxing culinary delights from the very same restaurants that they shake down. On one of these semi-uneventful days the guys are enjoying their meals when a terrorist explosion rips apart the restaurant they were collecting money from. Chuma and Steve have epiphanies about what just happened since they are one of the few survivors. Not only that, but since one of their handler’s is dead and the money they have collected is intact – they decide to take the money and get out of the life. With a renewed interest and zest at a new life the guys decide that going forward they will do nice things for those that deserve it but have no way of attaining these things. They answer notes left at one of the prayer walls in town and go about acting as “guardian angels” of sorts. Speaking of the handler that was vaporized, minus the money,– Chuma and Steve’s boss does not know their handler is dead – they’ve told him that he ran off, so their boss spends his time tracking down a dead man. Maktub is the sheer definition of “hijinks ensue” when it comes to the story. 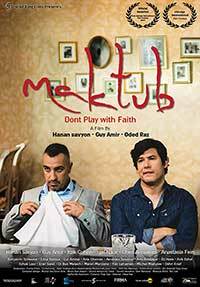 In reality the word “Maktub” is translated to: “everything is destined and written.” The film is peppered with humor and comedic moments along with some violence. The fact that it’s also native to Israel – it shows what the locals have to deal with in potential terrorist attacks and mobster violence. The film does a great job in balancing both of these dreadful occurrences with some hilarious comedic scenes and performances. In fact, some of the humor treaded lightly next to some of the darker elements like the violence around and in Israel. It reminded me of this really cool French film from 2011 starring Melanie Laurent called The Day I Saw Your Heart, which was about a free-spirited young woman whose father befriended all of her boyfriend(s) even after she broke up with them. It was a few. Well, that film had some really cool and scathing humor filled with some heart-wrenching scenes. Maktub does not have anything “heart-wrenching” in the typical sense but some of the character arcs, subplots, etc., tie into one another seamlessly and make for a satisfying movie-experience. Guy Amir and Hanan Savyon have worked together for years on this project and on various other endeavors. It also helps matters when they’re also the writers for Maktub, as well. They have a great chemistry as best friends and not just co-workers. I’ve said before and I will say it yet again: Netflix is doing a great job in acquiring more original world cinema content. Not only is Maktub a winner but it’s also one of the best films of the year as far as Netflix films go. I would not be surprised if it makes it on my Top-10 list of the year. This one is highly recommended! After surviving a terrorist attack in a cafe, two Israeli gangsters change their ways and decide to fulfill the wishes placed by people at Jerusalem's wailing wall. Maktub can be hilarious and has a giant heart, even when it touches on some dark material. Netflix has done an amazing job acquiring this piece of world cinema and I am hopeful that more projects with our leads are developed for the streaming service.